50 years ago Apollo 7 was named a 101% successful mission. It completed every objective and mission control even sent more items for the checklist as they progressed ahead of schedule. 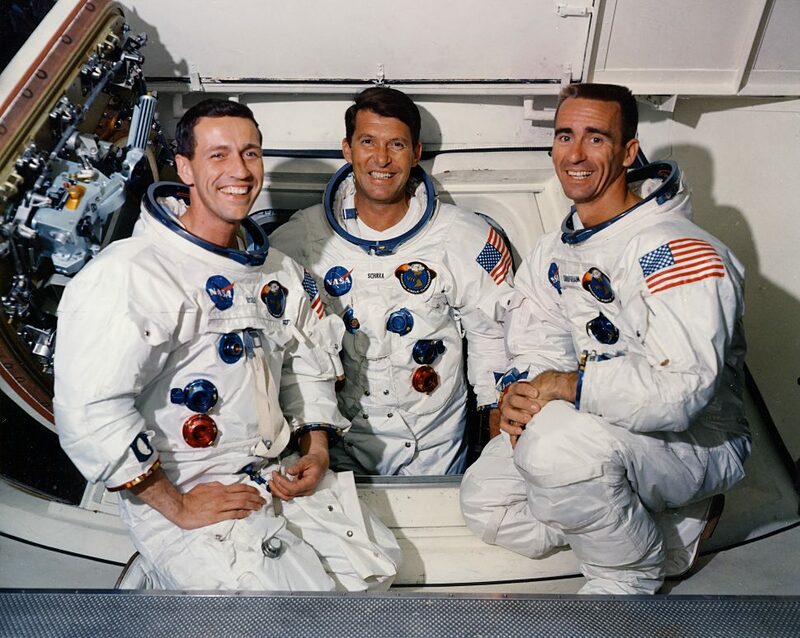 Apollo 7 was also the first proceeding manned mission after the tragic Apollo 1 fire which took the lives of Gus Grissom, Ed White, and Roger Chaffee. You may not realize that the Apollo 7 crew was actually the backup crew to Grissom's Apollo 1 crew and that they performed the same capsule test the afternoon before the tragedy with the distinction that it was plugs-in with the hatch open. As I prepared to interview an Apollo astronaut I wrestled with my inner space nerd about how to approach this task. What do I ask an astronaut? What do I ask a person who played a role in one of mankind's greatest achievements up to this point in our history? I really wanted to dive into some personal questions about his time in the early space program. NASA culture in the 1960s was at the top of the list and of course, I would need to inquire about his flown Speedmaster. I started to think about my kids as I began to jot down some ideas. My kids will study the moon landing in school one day and I'm about to have an opportunity to speak with one of the astronauts. What should I ask on their behalf? Walter Cunningham is a businessman, physicist, Marine Corps fighter pilot, author, and astronaut. Below you'll find out what developed in our conversation. The Apollo 7 Crew returns on Oct. 22, 1968. Left to right commander Walter Schirra, command module pilot Donn Eisele, and lunar module pilot Walter Cunningham. Photo Credit: NASA. Mr. Cunningham, thanks for taking the time to speak with me today, I'll kick right in if that's ok.So you were 36 when you flew on Apollo 7, is that right? And 31 when you joined NASA? I was 32 when I joined NASA. Was it ever hard to compute the magnitude of the responsibility that was being given to you? (Laughter) No, it was not. I was not the youngest one at the time. There were 2 or 3 others that were selected at the same time I was that were a year or 2 years younger than me. There was no problem. It seems astronauts are a little older today and it's inspiring to see that astronauts in the 1960's were younger and still managed to get everything done. There's no question about the change in the astronaut corps. You don't have to be a fighter pilot or test pilot today. There are a lot of scientists. Some of our guys probably wouldn't make it today. It has switched to what you can do operating machines that have already been up there and tested and all that kind of stuff. Was it ever hard to be present with what was happening at the time? I know you stayed quite busy day to day and were on the road 200 days a year for a couple of years there, but was it hard to be present and actually let sink in what you were being a part of. (Laughter) You're probably not going to want to believe my answers. No, it wasn't. I was a physicist when I joined them and I was a Marine Corps fighter pilot. I had a fair amount of experience, quite a bit of experience. I remember feeling that it was competitive and there was also…some of us detected…maybe everybody, I don't know I never talked about it…that detected your relationship…your social relationship might have a factor in it…or maybe some of the politics might be involved too. But I think everybody pretty much focused on what their strength was and I just did my best at whatever I did. I don't ever remember feeling deficient...a couple times I thought maybe they were favoring somebody else over me for some reason which I didn't know…but other than that it was just a general competitive spot and the attitude that people had…our society in those days…is a different attitude as our society as a whole has today in general. 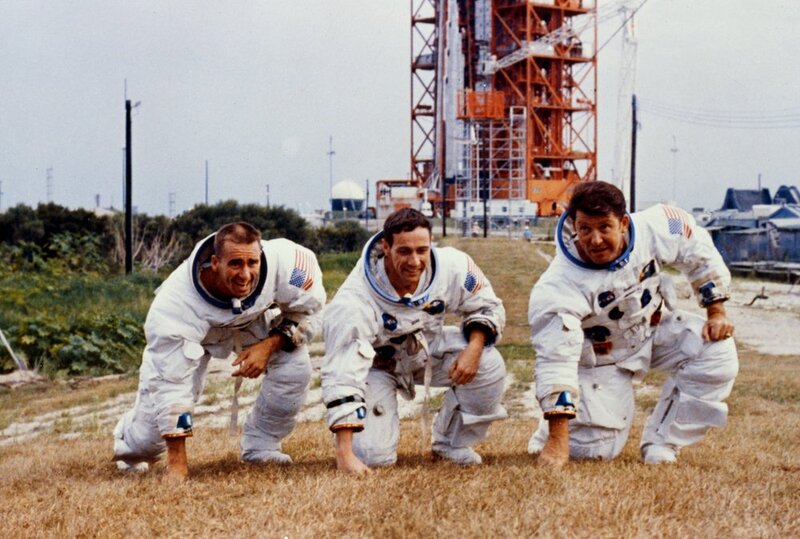 The prime crew of Apollo 7 takes a pose. Photo Credit: NASA. 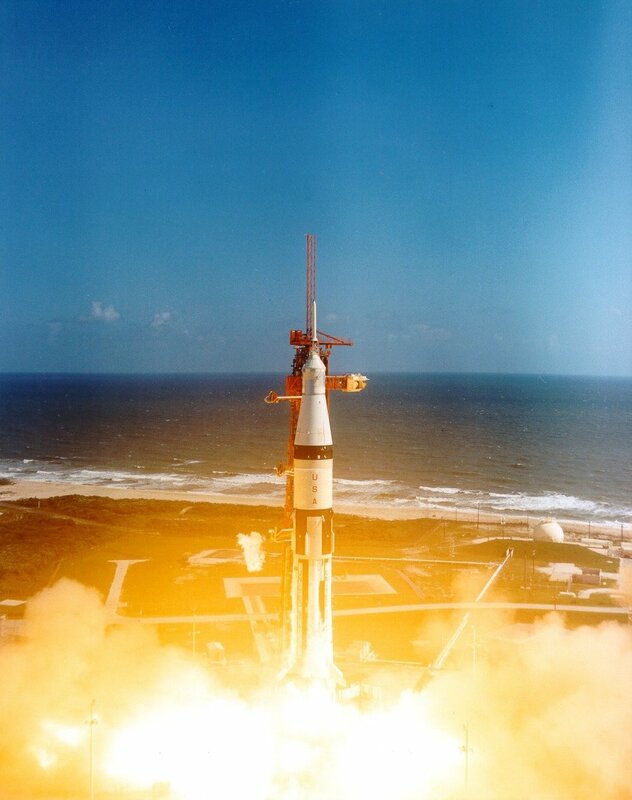 Apollo 7 Launch. Photo Credit: Nasa. 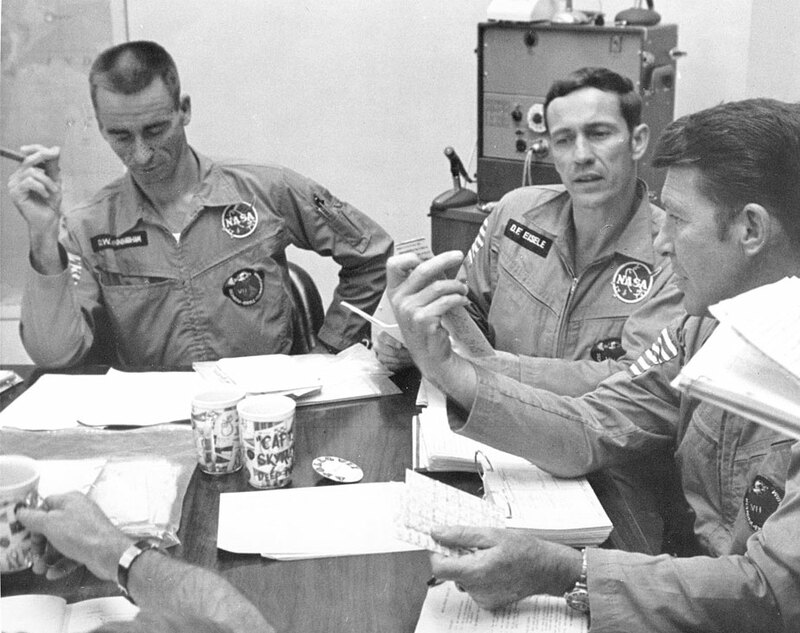 The Apollo 7 astronauts answer questions following an emergency egress training session. September 9, 1968. Photo Credit: NASA. Scan by J.L. Pickering. What was the leadership culture like at Nasa during that time? That's a good question. The leadership culture…I can't comment too much on it today because I may not be as familiar with it. I was then. I think a certain amount of politics may have been playing there. Especially in the military there's a sense of confidence that comes when you know somebody's capabilities…you've flown with them…I say flown with them…we were single-engine fighter planes mostly in those days. You've flown with them, you knew how their mentality was working, you knew whether they were willing to tackle what had to be done and ah frankly I always felt I was extremely strong in those particular areas and most of the people we had they were too…occasionally there were some that I thought were weak but that's the way it was. It seems like back then there was a strong root of confidence in most people working at NASA and that was a big part of the Nasa DNA in the '60s. Yes. It was a lot like the military experience when you report to a new squadron and if you've got an egotistical attitude about yourself flying you immediately start spotting the strengths that some people have and what they don't have. Ah…In the airplanes you used to just try to get into some competition in the air so you could show him that you could whip his tale…if you could. It was an egotistical sense but it wasn't obtrusive. There wasn't anything disgusting about it you were just very observant. I wrote about that in my book 41 years ago and that's some of the things that I mention and I'm very candid about it. Was there ever a situation that you felt like you had to lead up even though you weren't in charge? Meaning someone else was in charge? Yes, whether you saw something that wasn't being done properly or something that you just felt the need to speak into. I know that can be a big tension in most organizations. There were occasionally…I can't put my finger on just what it is…but there were occasionally times when we felt like…I speak for myself I guess but I had a better idea on what we should be doing to handle something. That was not very often and most of us had no reservations about mentioning that and we were all trying to get into the air and the Mercury program was over and it wasn't single (crew) so you knew you had to be perceived as pretty decent by somebody else…so you could get along. (laughter) but as a matter of fact, I'm one of the very few people that probably spoke out in a pilot's meeting or something like that where other people might now. You could stick your neck out a little bit and sometimes you get away with it and sometimes you didn't. 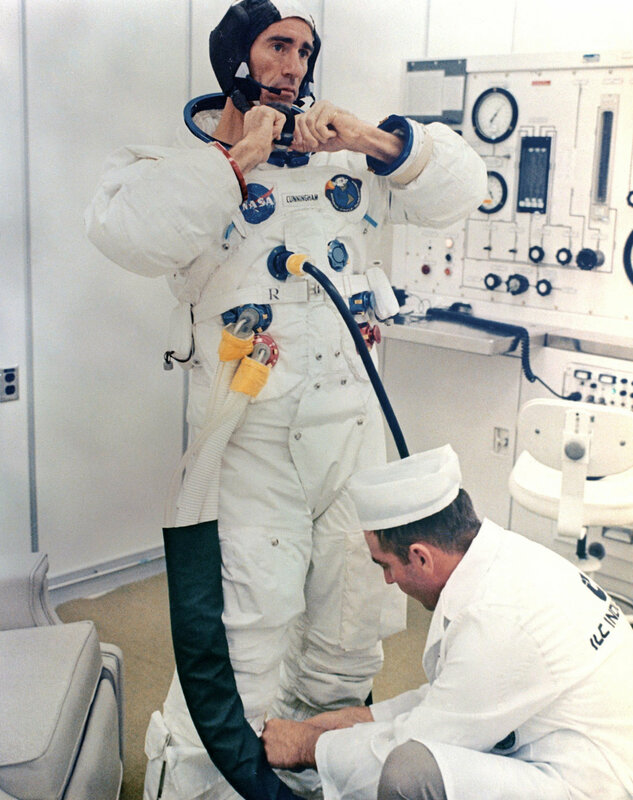 Walt Cunninghamadjusts his pressure siit with the help of a suit technician on launch morning. October 11, 1968. Photo Credit: NASA. Scan by Ed Hengeveld. Apollo 7 Prime Crew. Photo Credit: NASA. Astronaut Walter Cunningham in orbit. Photo Credit: Nasa. you were on the backup crew when the apollo 1 fire HAPPENED. I’m curious about the apprehension that must have crept in that situation and how did you handle the fear after seeing what was happening with the build quality of the command module. How did you step back into that role with confidence? Ok…A little more background. 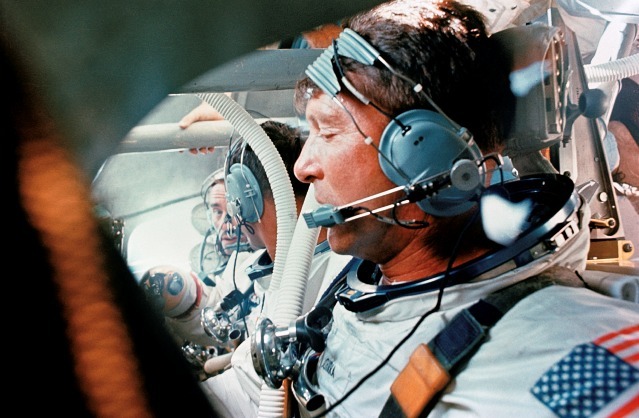 We were…Wally Schirra, Don Eisele and I were on the prime crew for what would have been considered Apollo 2. You had Gus Grissom with Apollo 1… Although those were not the official titles or the official numbers for those things. The reason we refer to them that way today is because Gus always wanted his flight to be called Apollo 1. It would have probably been oh about Apollo 4 because it also included the unmanned testing of the boosters and things like that. With that kind of labeling system, we were the Apollo 2 crew and we were living, practically, with the contractors out at North American because things were just getting started. We were interested in helping to install. There were no simulators so we had to get hands-on experience in how it operated and all that and so we participated in design reviews. In one year, I was on the road 275 days. We were out there living with the engineers and some of them appreciated our input a lot. Others were maybe a little more reluctant, but mostly they were glad that we were there. What was your question again? How did you deal with any apprehension or fear after seeing a tragedy like that happen knowing you were next in line to get in the cockpit? They were sitting there with their hands praying in front of them about the safety. They did that for a joke when someone was doing the filming.But there was some concern, but it wasn't overriding. We were pretty shocked when the crew died because we were on the way home from the center down there and when we landed we found out about it.Our concern was, oh, to some degree it might have been, "I hope it doesn't cause the agency to cancel". I wasn't one of those people that thought they would, but we also were concerned that they might have something coming along where we wouldn't be inheriting the flight like we were supposed to.A couple weeks later they officially announced it.And so, we went on from there and because of that accident we had a whole lot more reception and authority at North American and the other Nasa people that were working on it and the engineering people that were a lot more involved in those things than we were. We were a part of the observers and reviews and things like that.We weren't responsible for doing the design.We got a much bigger reception at North American and let's see… It took us 21 months to make changes.I think there was like 1,040 changes of one kind or another and they weren't all safety oriented. A lot of them were operational things, even on just the switches that were in the spacecraft and the protection of potting loops on the side of them.There were a lot of things that went on, but because of the time that they had to be done that affected safety that left us able to get some other things done as well.So, with 1,040 changes…minor otherwise…and it was what 19 months? 21 months? October 11 and the accident happened on Jan 27th…so…yea it was about 21 months…we launched and that may have been the most perfect spacecraft we've ever flown. It was in remarkably good shape. We only had the alarm go off once. We were getting enough things done that they even added 4 mission objectives while we were in orbit.When we landed they declared it 101 percent successful. Prime Crew photo of Apollo 7. Photo Credit: NASA. Walter Cunningham working in orbit during the flight of Apollo 7. Photo Credit: NASA. Apollo 7 astronauts (l-r) Walter Cunningham, Donn F. Eisele, and Walter M. Schirra, Jr., compare notes at a mission debriefing conducted today at the Kennedy SpaceCenter. October 23, 1968. Photo Credit: NASA. Scan by Ed Hengeveld. Caption by Kipp Teague. Water egress Training. Photo Credit: NASA. Well…(laughter)…I can't even think of that because as I said we were fighter pilots. We felt like we were capable and in general we were capable for what we had to do. I was a physicist. I was in the last year of my doctorate of physics when I went down there so I was capable of operating at a level with a lot of the technical folks and we were focusing on flying a new airplane, not on design aspects. Today they are in a different kind of mode. Bureaucracy has increased a lot. So even a new astronaut today wouldn't have near as much input or authority as he did back in the 1960s. I also wanted to ask you about your Speedmaster. There's not a lot written about how astronauts received their watches and when they were required to return them. Well…I'm wearing a Speedmaster now. Actually, we started using the Speedmaster for good reasons ya know, they were the right kind of watches for us. Occasionally somebody like Don Eisele wore two watches because he was the navigation guy. He wanted to make sure he always had a backup. The watches seem to be perfectly fine to me when we got back from the flight. We were supposed to turn them back in but I was one of those that didn't for a while. I kept wearing it and eventually Nasa said, "hey, we need to get that watch." Because what they do is take that watch and assign it to another crew member. I was told by somebody at the astronaut office who was more powerful than me to go buy another watch. Buy a new watch and give that to them and have them put the number on it. I think it was number eleven or something, I don't know. Well, I went and got the watch. I paid all of $98.00 is what it cost. OH WOW (is this you?) (laughter) yea. That's right. I think the same watch, of course it's better now than it was then of course, I think the same watch now is about $4,000.00 or something. But, I gave that to them and I kept my watch that I flew with for several years until somebody in the department of handling the watches, they had that watch and hadn't put the number on it yet so they came and got my watch. I don't know where in the hell it is now (laughter) so I'm wearing my own Speedmaster (laughter). (Laughing) How did that happen? Did they just come knocking on the door and say "hey, give us the watch!" I can't remember I think I got a call or something that said: "hey you need to turn your watch in." It's because they never took the watch that I gave them to put the number on the back. Do you remember any moments in the flight where you used the watch? Well, we used it for a variety of different things and we were also tracking time. We had air to ground communications coming up. Do you have any idea how much air to ground communications we had? NO IDEA Well it's right close to 100% today. They have 3 satellites that provide it. Wanna guess how much we had? NO IDEA We had about 4% and sometimes that intruded on us. It was the longest most ambitious test flight ever flown so we were busy all the time. You'd be coming up over one of the stations on the ocean or in Australia or someplace and the ground always had to take advantage of that because they had things to pass up to us. Sometimes information on the navigation system and stuff like that. We almost invariably would talk to who we could, but it wasn't very often and we were busy on an experiment or a test and all of a sudden here would be coming up air to ground and we'd start to do something else and then go back to what we were doing. We were able to get in touch with Bob Welch at the Frontiers of Flight Museum in Dallas and he was able to send us some photos of your flown Speedmaster. They have it on loan there from the Smithsonian. I was wondering why the bracelet ended up on it? Most of the Speedmasters got turned in on the large Velcro straps. Knowing a little of the backstory now I'm guessing it made its way back onto the original bracelet after it was turned back in? I don't ever remember having a bracelet. Don't know. Walter Cunningham’s flown Omega Speedmaster. Photo Credit: Frontier of Flight Museum. Today they fly all kinds of good stuff for themselves up and back. People didn't' even keep parts of the spacecraft back in those days until about oh, about Apollo 11 they kept a couple things in there, but Apollo 12 they started carrying things out of the spacecraft. We didn't carry a thing that we didn't have packed in our flight suits. Well there was a little bit…we were allowed a half a pound official. The other stuff wasn't official. Are you wearing the old style Speedmaster or the Newer X-33? It's not the latest, but I can't say that it's exactly like my other one because we have more buttons to push on this one. It's signed like its what they were putting out then, but I think it's a little better than the one that I had originally. In your book The All American Boys, you wrote a bit about the scandal of some of the crews selling flown items and how that was frowned upon. There was a sentence that caught my attention where you wrote specifically about Dave Scott and that there were 2 watches that went up with Apollo 15. I know recently that Bulova sold for 1.625 million dollars. You mentioned there were 2 watches. Do you know or have any other recollection about that? I don't and I didn't know at the time. I'm absolutely amazed at what the public is willing to pay for some of this stuff. I have my flight plan and my notes and a few things like that that I flew with and then I had a big handful of flags that I stuck in my flight suit. A lot of that stuff was kind of unofficial. We never got one piece. The only thing that I have from that spacecraft was something that was given to us a couple weeks later. North American carried I don't know how many, but at least 3 or 4 of the little metal of the parts identifications. Identifying the spacecraft. So, they gave me one of those that flew. Of the metal stuff that's the only thing that I've got. It got to the point where some of the crews would actually keep the hand controller on the Lunar Module and get it back into the Command Module and bring it back with them. Some of that started going on after about Apollo 12 I think. Did they just have free reign to claim stuff at that point? No. No. (laughter) they got away with it though. They weren't being pushed and enforced I don't think. Well, actually, after the Apollo program was over they eventually clamped down really hard on that. In your years of business after the space program was there ever a time where you had a failure that you turned into success or something that gave you the leverage or fuel you needed for success? No, I don't remember having a failure. I remember I had a variety of different activities. I had my own venture capital fund. I ran two engineering firms. I had a radio call in a talk show one time later. I was busy. I didn't start doing speeches until around 70. The venture capital fund at the time was early in the venture capital business. It took me two years to raise a 19 million dollar fund here in Houston and there were no other funds at the time. It was a different business then than it is now. I had one partner. He and I worked together to do it. I think that fund lasted about 11 years and he didn't want to raise another one. I spent about a year trying to raise one by myself, but the investors all wanted more than one person to run the fund and I can understand that now. Our return was about 14%. A really good venture fund can have a much higher return, but it was ok and provided a lot of pluses in the years that have gone by, but I don't think I was particularly great at that one. A lot of the other things that I did I was very successful…pretty good. So, I don't know. I think I've had a good life and a pretty successful life. I really enjoyed reading your book The All-American Boys. I enjoyed the audio version. It's pretty cool that you narrated it yourself. I've read a lot of books centered around the early space program and I'd say yours is right up at the top as far as having the most detail and story around all the different topics. I enjoyed diving into it. Well, it was considered and still is considered in general the best 1 or 2 books ever written on the space program. Mike Collins book "Carrying the Fire", they're put together sometimes as the top. It was very well written. He didn't go into all the candid stuff that I did. What happened to your relationship with Don Eisele and Wally Schirra after the space program ended? Did you guys stay in touch? Did you just see each other at reunions? What happened to those relationships? Well, we stayed in touch, but it wasn't like a really close friendship all the time. We were a bit irritated. If you read the book you know Wally was kind of a pain in the you know what right after we got started there. He had a cold and so he said that everybody had a cold which we didn't. I never had a cold. I remember Don may have coughed once or twice the first day we were up there but he never had a cold either. We did take the pills. Wally insisted. If Wally had a cold everybody had a cold. So, we took the pills. (Laughter) Don and I, we did a little preventative measure that Wally thought he was too good to do. (Laughter) We lifted off on a Friday and the preceding weekend we had gone hunting locally for birds and in the area, it was kind of cold and wet. We found out later that we had gone 2 days before the hunting season had even started. So, we were down there and it was cold and wet. We were heading back I remember I was riding back with our nurse at the time to the launch center. Then Eisele and I, I think it was the next morning, we decided we should get a shot incase we get a cold. Ya know, we couldn't do that with the Nasa doctors so we went outside Nasa and got a doctor and a shot for the cold. I don't know if that's what prevented it or not. We asked Wally, "Hey, Wally we are going to go get a cold shot do you wanna go along?" NO, NO, NO…(laughter) so he didn't do it. It's a good thing! Sounds like it kept you guys from getting sick up there. Walter Cunningham at work in the CM. Photo Credit: NASA. Astronaut Walter Cunningham outside of building 4. Photo Credit: NASA. The crew of Apollo 7. May 22, 1968. Photo Credit Nasa. Scan by J.L. Pickering. My kids are 7, 5, and 1. If you could impart or speak a word of wisdom over a new generation of kids what wisdom would you speak over them? I do have some advice. I've occasionally given it. I don't think it's all that well received and I don't think it's necessarily followed. What they are pushing today is that everyone is equal. I don't think everyone is equal. I don't think anyone has ever been equal. There are winners and losers. If you're really smart and do something that makes you a loser you use that to correct yourself and come on and try to be a winner. Today they like to say that everybody should have the same outcome. I definitely disagree with that. I think everybody ought to have the same opportunity. Should not keep anyone from having an opportunity, but to do that you also have to have young people willing to stick their necks out. That's not as popular today either. Maybe I feel as strongly as I do about it because I started out probably the poorest guy back then that became an astronaut. I started working when I was 9 or 10. Worked my whole life. Out of high school, I joined the Navy. I delivered papers and things like that back in those days. It took me about 8 years on active duty in the Marine Corps when I was in Korea then I decided that I was going to transfer into the reserves when I could which took another year or year and a half and go to college. I started college, I think I was about 26 or so when I started college. The message I have for young people is that you've got to be willing, willing to stick your neck out. You don't just expect the rest of the world to hand you what it is. The rest of the world might take advantage of you if you've got the right kind of IQ, willingness to work, and the right attitude and all that, but don't try to ride on it. Try to look out for your future. Don't just wait and think it's going to be delivered to you. There's a famous photo of you looking out the window. You've got your sunglasses on and it's dark in the command module. Do you remember what you were thinking or feeling at the time of that photo? I was just working. We took pictures of each other from time to time. We had real film. We didn't have any of the electronics. I think we had 440 frames of pictures that we could take and a lot of people like that picture of me and ah (laughter) I'm using a Space Pen. What I know about the Space Pen now is a lot different. Then that was just the pen that we used. In that picture, you can see the pen…and the people that made that eventually asked me if they could use that picture and I told them yes. From my perspective, it's kind of interesting. Walt…I'd just like to say thanks so much for taking the time today to speak with us. It's been a real pleasure and it means a lot. It was a real pleasure to speak with Mr. Cunningham. I hope you’ll take some time to read his book The All American Boys. The book is one of the most in-depth presentations of the early space program. You can purchase it on amazon HERE in Kindle, paperback, audiobook (Narrated by Walter), and hardback versions. Walter mentioned recording the audio version took him 3 1/2 months. It’s a great experience to listen to him tell his story. For additional reading, here is a link to the actual Apollo 7 Press Kit. Enjoy.